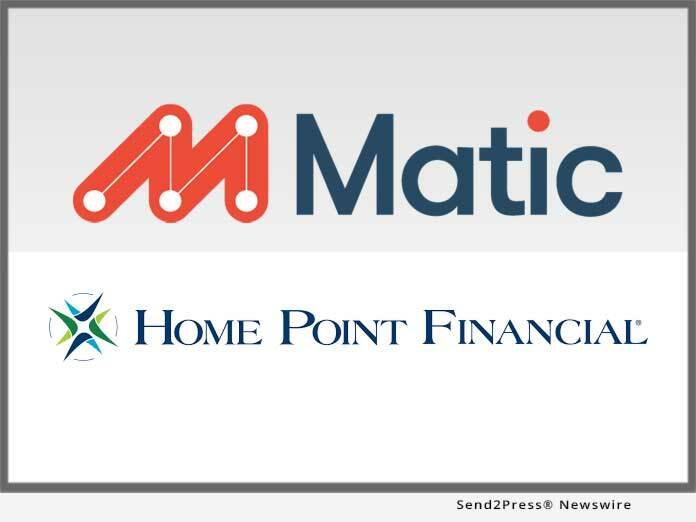 Digital insurance agency Matic announced today that it has partnered with Home Point Financial Corporation (“Home Point”), a national, mortgage originator and servicer, to help its mortgage servicing customers find competitively priced homeowners insurance. COLUMBUS, Ohio /Mortgage and Finance News/ — Digital insurance agency Matic announced today that it has partnered with Home Point Financial Corporation (“Home Point”), a national, mortgage originator and servicer, to help its mortgage servicing customers find competitively priced homeowners insurance. Matic is a digital homeowners insurance marketplace built for mortgage servicers and lenders. Matic’s proprietary technology analyzes data from loan origination and servicing software to give homebuyers multiple policy options within seconds – without any manual data entry or lengthy questionnaires. With more than 20 A-rated carrier partners and industry-leading customer service ratings, Matic helps loan officers close deals faster and enables mortgage servicers to delight customers with an average of $517 in unexpected savings. For more information, visit https://matic.com or follow Matic on LinkedIn. Located in Ann Arbor, MI, Home Point Financial is a subsidiary of Home Point Capital LP, a financial services holding company founded in 2014 and owned by members of management and by investment funds managed by Stone Point Capital LLC. For further information about Home Point Financial, please visit https://www.homepointfinancial.com.